The included study material consists of online practice exams that help you quickly and easily learn all required study material to study for the written test for a Class C CDL license with Hazardous Materials endorsement. Applicants for a Class C CDL with H endorsement license must be proficient in material from the General Knowledge section of the manual (Sections 1, 2 and 3), and Hazardous Materials (Section 9). If you will be driving vehicles with Air Brakes, you will need to take the Air Brakes test (section 5). If you will be driving combination vehicles, then you will also need to take the Combination Vehicles test (section 6). The general knowledge written test must be passed before applicants can proceed to take the pre-trip inspection test or the driving skills test. 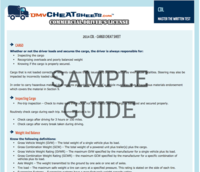 The Pre-Trip Inspection “Cheat Sheet” is included as a FREE BONUS when you purchase this bundle.